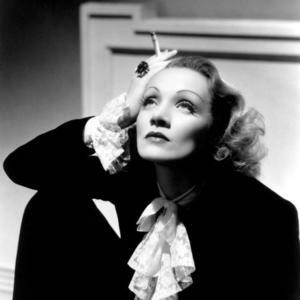 Marie Magdelene Dietrich von Losch (aka Marlene) was born in Sch?neberg bei Berlin, Germany on December 27, 1901. Her father was an army officer who had served in the Franco-Prussian War. Because of his constant absences due to his army duties, Marlene and the family had to rely on themselves. After he died, while she was 11, Marlene's mother married Eduard von Losch and he adopted the Dietrich children. Marlene was known in school for her "bedroom eyes" and her first affairs were at this stage in her life - a professor at the school was terminated. Marlene enjoyed music and attended concerts. She was adept at playing the violin and piano. By the time she was in her mid-teens, Marlene had discovered the stage. Acting was to be her vocation. In 1921, Marlene applied for an acting school run by Max Reinhardt. She was accepted. She appeared in several stage productions, but never had more than a couple of spoken lines. In short, she wasn't setting the stage world on fire. She attempted films for the first time in 1922 Her first film was So sind die M?nner (The Little Napoleon) (1923) which was followed by Trag?die der Liebe (Love Tragedy) (1923). On this last project, she met Rudolf Sieber and married him in 1924. The union lasted until his death in 1976 although they didn't live together the whole time. The remainder of her early film career was generally filled with bit roles. After being seen in the German production of Der blaue Engel (The Blue Angel) (1930) in 1930, Marlene was given a crack at Hollywood. Her first US film was Morocco (1930) with Gary Cooper, which was followed by Dishonored (1931). This latter movie had her cast as a street walker who is appointed a spy. The film was rather boring but was a success because of Marlene's presence. In 1932, Marlene filmed Shanghai Express (1932) which proved to be immensely popular, grossing $3 million. Once again, she was cast as a prostitute. The next film was Blonde Venus (1932) which turned out to be a horrible production. Her co-star was Cary Grant and once again she was cast as a prostitute. During this period Dietrich had been typecast as a woman of low morals and she wanted different parts. Her chance came in 1939 in Destry Rides Again (1939) when she was cast as "Frenchy", a Western saloon hostess. This began a new direction for Marlene since it shed the previous typecasting. All through the 1940s, she appeared in well-produced, well-directed films such as Manpower (1942), The Spoilers (1942), The Lady Is Willing (1942) and Pittsburgh (1942). Afterwards the roles came less frequently, perhaps one to two films every year. In 1945, Marlene didn't appear in any. She only made seven productions in the 1950's. Her last role of any substance was Judgment at Nuremberg (1961). Despite the lack of theatrical roles, Marlene still made appearances on the stage. However, by 1979, she was a shell of her former self. After breaking her leg in one performance, she never made a go of it in show business again. Spending the last 12 years of her life bed-ridden, Marlene died on May 6, 1992 in Paris, France of kidney failure at the age of 90.